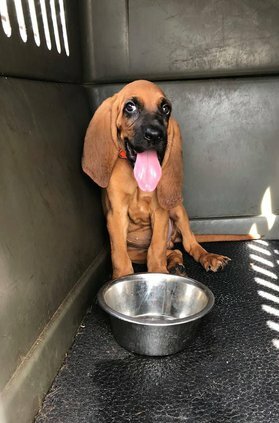 Local dog trainer and breeder Michael Duncan, a former law enforcement officer, donated this bloodhound pup to the Statesboro Police Department as a future tracking dog. Updated: Sept. 8, 2018, 9:11 p.m.
One of the newest members of the Statesboro Police department has long, floppy ears and a lolling tongue to match, but within a year, puppy kisses will give way to a nose that knows. The yet-unnamed nine-week old bloodhound is destined to become the department’s first tracking dog. The pup isn’t just an everyday bloodhound. His sire is K9 Red, Duncan’s personal tracking dog that has become a local celebrity. Red has an impressive record when it comes to tracking people, and several regional law enforcement and other agencies across the Southeast contract Red and Duncan on a regular basis to help find lost children, missing persons or fugitives from the law. Just Wednesday, the team helped the Evans County Sheriff’s Office track an injured, intoxicated man who had walked away from a vehicle crash, he said. His decision to donate the pup came after research and talking to local police. The chief said he is excited about the new addition. The department is taking suggestions from the public via its Facebook page on what to name the little fellow, and three of the top names will be submitted for a final public vote, he said. Duncan said he picked the pup out of Red’s latest litter with another of his bloodhounds, Maybelle. “He was my top pick.” Two other pups from the litter were chosen, and are being trained at Georgia K9s in Edisto, South Carolina. They will be sold to other law enforcement agencies as tracking dogs, he said. Duncan became interested in law enforcement K9s several years ago, and when he found Red, his second bloodhound, the dog’s eagerness and ability “lit a fire,” he said. He bred Red to Maybelle, seeking another exceptional dog, but “they don’t come in every litter.” This time, Red’s and Maybelle’s second litter, produced at least three candidates, including the new SPD pup. The pup will be trained for about a year. He will have a specific officer assigned to be his handler and partner, and the department is already looking into budgeting feed, veterinary care and a new patrol car with back-seat air conditioning for the dog, Broadhead said. When the officer is chosen he will work with Duncan and the puppy during training. The Statesboro Police Department will periodically post updates on the puppy’s progress in the department’s Facebook page. Broadhead urged the public to participate in the name suggestions and following poll to choose the pup’s official name. More about the puppy can be found at www.facebook.com/StatesboroPD/.